There's no comic-book hero I know of whose origin story begins, "I was lying in a swampy forest when suddenly, some dirty water trickled onto me. "* But with roads and traffic crisscrossing their habitat--and runoff leaking into the pools where they breed and grow--salamanders have had to develop their own superpowers to survive. 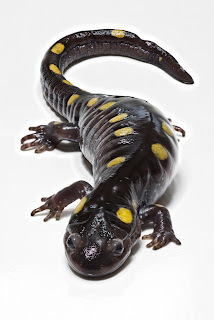 Yale researcher Steven Brady recently studied spotted salamanders (Ambystoma maculatum) living in range of street runoff. Amphibians such as salamanders or frogs are vulnerable because they divide their time between land and water and can absorb pollutants through their skin. They also have a tendency to develop freakish mutations and alarm school groups. (Or, say, people who are just looking for a nice A. maculatum photo to illustrate a blog post, not a dozen pictures of a salamander with three arms coming out of one shoulder.) How is runoff affecting salamanders that breed in roadside ponds? From every pool, Brady plucked out a set of salamander eggs that would stay at home, and another set that would travel. He swapped the traveling eggs between their paired ponds. Then, with home and away eggs safely tucked into enclosures within each pond, Brady waited for the salamanders to hatch. Two results became clear. The first was that if you're a salamander egg, a nearby road is not your friend. In the ponds deep in the woods, 87% of eggs survived and hatched successfully. In ponds next to a road, that number plummeted to 56%. 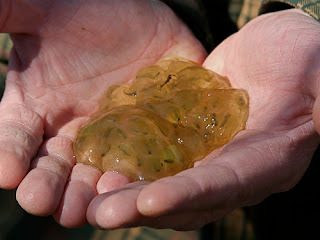 The second result came from comparing the two kinds of eggs within those deadly roadside ponds. The survival rate wasn't the same for local versus visiting salamanders. The eggs that had started out in the roadside pond were, on average, 25% more likely to hatch there than eggs that came from ponds deeper in the woods. It seemed that the roadside salamanders were better adapted to hatch in poisonous ponds than their clean-living peers were. But there was no complementary effect in the deep-woods ponds. The roadside eggs survived just as well there as the local eggs did. So this wasn't a question of salamanders in each location laying eggs that were better suited to their environment. Rather, the road-adjacent salamanders had apparently evolved extra protection against toxic waters. What exactly was in those waters? Brady found that water in his roadside pools conducted electricity better, indicating that ions or metals were present. This is what you'd expect to find in runoff from roads. Chloride ions, from road salt being washed away in winter, are an especially likely culprit. Brady notes that for four out of the five roadside ponds he studied, the roads adjacent to them were only built within the past 50 or 60 years. Within that brief time, the local salamanders have apparently evolved to better survive the polluted water. Spotted salamanders spend almost all their time on land, creeping under rocks and damp logs on the forest floor. But once a year, they return to their favorite local pond to mate and lay eggs. These ponds are usually temporary ones that reappear with each spring's rain and snowmelt. Salamanders roam over a larger area during the non-breeding season, but other research suggests these animals are faithful to one breeding pond. Fidelity to a site that kills an extra one-third of your eggs must provide a powerful selective pressure. In each generation, those eggs that can't survive the toxic water get removed from the gene pool. The eggs that are resistant to runoff materials hatch and go on to parent the next generation. Since these mutant salamanders aren't any more fit than regular salamanders in non-polluted ponds, it doesn't seem that their superpower gives them any advantage in the world outside their breeding pools. They're unlikely to grow large muscles, leave the woods and start fighting crime. They're just demonstrating how nature can make the best of a world sullied by super-villains. *Correction: I've been informed by my dad that there is, in fact, such a superhero. Called Swamp Thing, he's a man transformed into a "humanoid mass of vegetable matter" by some swamp chemicals. Fittingly, he is a defender of the environment. The teenage mutant ninja turtles' origin story was basically one of "dirty water granting superpowers", too! Of course, if you're living in a sewer to begin with, it's a little more expected.